Easter in Paris is becoming a habit. This was our third Easter in Paris in five years and we are definitely creatures of habit with our favourite places to visit in Paris off the tourist trail. We were staying as guests of Eurocamp at International Maisons-Laffitte holiday parc and spent Easter Saturday and Easter Sunday exploring Paris. For more detailed explorations of the best Paris patisseries to follow on Instagram and the coolest neighbourhood in Paris I found 20 years ago check the list beneath this post. First here’s the potted version what we got up to and includes a few things that might otherwise have been missed. Ted is a massive fan of the Paris Metro and I’m keen to boost my step count. So our days were a mix of lots of walking and short hops on the train! 10am: Leave Eurocamp at Maisons-Laffitte and take RER train to Auber, the station closest to Galeries Lafayettes and other department stores on Boulevard Haussman – Paris’s answer to Oxford Street. 11am: Walk around Place du Madeleine and visit Fauchon which had been closed on my previous trip. It’s still under refurbishment as was Hediard over the road so I will do this area justice another time. Fauchon sells the most incredible eclairs that feature heavily in my eclairs and choux Pinterest board whilst Hediard sells lots of teas, coffees and preserves. 12 noon: The roof of Galeries Lafayettes boasts the best FREE view of Paris taking in the Eiffel Tower, Sacre Coeur, Pompidou Centre and much more. Like many Paris photo opportunities, it’s also selfie stick central. In more clement weather there is a cafe and champagne bar open up there. Department stores are also a handy place for a family loo break. 1pm: Ted opted for Pret a Manger for lunch. He likes the macaroni cheese they serve hot in cardboard boxes. I know. We go to Paris and end up in Pret a Manger which is identical to Pret a Manger in London. This was a concession store within the ground floor food hall of Galeries Lafayettes Maison (over the road from the main store) but there are branches of Pret popping up over Paris. Rather like London has branches of Paul everywhere. In my defence, last year he made us visit Burger King so this is an improvement. There’s also a concession for Christophe Adam’s L’Eclair de Genie and I couldn’t resist buying us an eclair each. The flavours from left to right are lemon yuzu, chocolate and salt caramel. In the main Galeries Lafayettes we had to ogle the iconic glass dome. This is Paris’s answer to Selfridges or Harrods. When you’re on the roof you can see the dome casing from the outside. 2pm: From here we walked towards Les Jardins de Tuileries and over towards the Left Bank. This instagram was taken in the window of Le Marquis de Ladurée close to the Louvre. I am not entirely sure if this is a separate business to the usual Ladurée. Paris always has the most wonderful Easter displays and I was proud this picture became my first to break 200 instagram likes barrier. 3pm: Met up with one of my original blogging friends and Left Bank resident, Hilda, of the sadly missed Saffron & Blueberry blog. Whilst Nick and Ted played in the playground next to the French Prime Minister’s residence, Hilda guided me around the local patisseries and chocolatiers which I will feature in their own post. 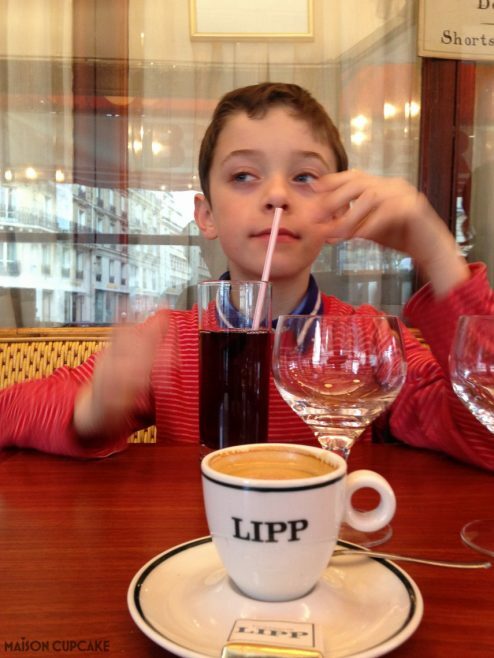 5pm: Pitstop at Brasserie Lipp in St Germain. I didn’t intend to look all Existentialist (nor for Ted to appear to have a straw poking up his nose) but there you go. It was much quieter than Cafe de Flore and Les Deux Magot opposite (the famous Existentialist philosophers’ haunts) so we had a ringside seat inside this veranda facing the main street. The waiter got very excited that a famous actress was outside posing for photos with some fans but we didn’t have a clue who she was. 7pm: We returned to an old favourite – La Coupole on Boulevard Montparnasse. Unlike Montmartre this neighbourhood is much less touristy but feels quintessentially Parisian. 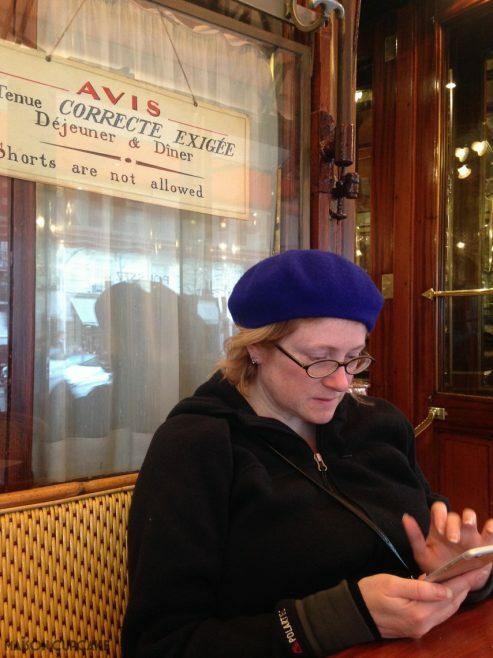 Last time we’d sat tucked in the corner next to the favourite table of Simone de Beauvoir and Jean Paul Sartre but this time we were in the middle of the action watching waiters buzz around theatrically delivering towers of seafood and blow torching creme brûlées. 9pm: A minor detour on the way back to Maisons-Laffitte meant I finally got to see Le Moulin Rouge lit up in all its glory. It’s only taken me twenty five years! Although I’d been told Pigalle had cleaned up its act lately it still seemed pretty seedy. So maybe don’t take your 8 year old here at night unless you’re prepared for awkward questions. 10am: Exploring Maisons-Laffitte then a re-run of yesterday’s journey into Paris, this time changing trains and disembarking at Republique. 12 noon: Lunch at Mems in Rue de Marseille near Canal St Martin. We are fond of this neighbourhood – read more detail here. 2pm: Hopping back on the Metro, our plan had been to visit the science museum in the Parc de la Villette further up the canal. Ted however had other ideas. We ended up boarding a tram towards Porte La Chapelle to add to his list of transport experiences! (The Sevres-Babylon picture was from the day before where we’d said our goodbyes to Hilda). 4pm: Back on the Metro again from Porte La Chapelle to Lamarck Caulaincourt approaching the tourist infested Montmartre from the less obvious northern side. I don’t know if the atmosphere of Montmartre has been ruined by tourists 365 days a year but it certainly had today. The main square was horribly busy, densely packed with people shuffling at snails’ pace past a series of terrible portrait artists and tourist trap cafes. We would have done better to seek out the bar from Amelie further down the hill which we missed on our exploration of locations from Amelie in 2012. From Anvers we took the Metro to Rambuteau (where I always want to burst into a rendition of Juliette Greco’s Dans La Rue des Blancs-Manteaux). With the miracle that is meta tagging on old Apple photos (my husband never empties his phone even though he constantly complains it is full) we tracked down Cafe Grizzly that we’d visited in the Marais in 2015. So this photo is from that occasion as Ted’s missing teeth gives away. 6pm: Walked over the Ile de la Cîté towards Boulevard St Michel and the neighbourhood where I stayed on my first trip to Paris near the Sorbonne. It was very busy with tourists and beggars around the Latin Quarter so once more we went to our safe stamping ground of Boulevard de Montparnasse. 7pm: Getting off the Metro at Vavin outside La Coupole for second time in 24 hours, we walked towards another favourite haunt, crossing the Boulevard Edgar Quinet towards Rue de la Gaîté close to where we stayed in 2012 at the gigantic Pullman hotel in Montparnasse. This is a lively area packed with bars and restaurants but apparently totally off the tourist trail. 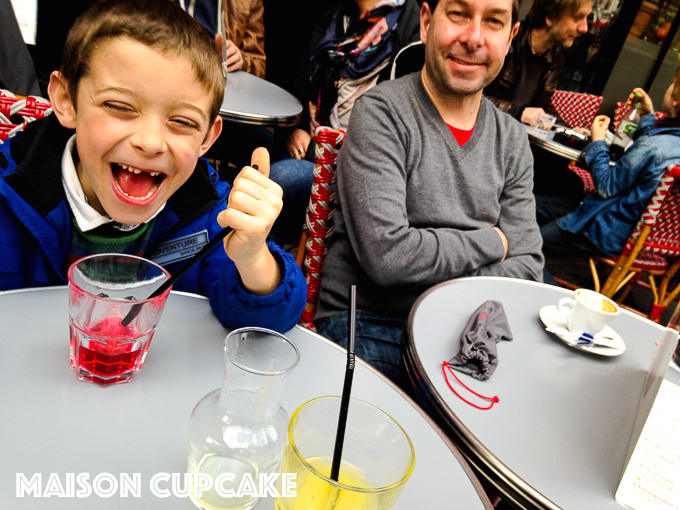 On Easter Sunday 2015 we’d had crêpes in one of Rue du Montparnasse’s many crêperies. The story goes that because the railway line from Brittany to Paris arrives at Gare Montparnasse that this was the pocket of Paris in which the Bretons set up their community. However tonight we went off piste and dined in a squeaky clean looking sushi and Asian buffet restaurant Comme Chez Soi. We had a good value meal here although weirdly neither of us took photos and I can’t find anything embeddable online. Comme Chez Soi offers serve yourself sushi and grilled “a la plancha” meat and fish and an array of salads and desserts for around 20€ per head. The staff were very friendly and we’d definitely visit again if only to try everything we didn’t have space for first time around. We travelled back to the holiday parc slightly earlier than Saturday night as Storm Katie was brewing. We awoke in the early hours with a Wizard of Oz sensation our house might blow away but fortunately Katie had calmed down by the time we checked out that morning! I will leave you with a YouTube video of Ted’s new favourite game. Paris Metro Simulator. Complete with sound effects and tannoy announcements it’s oddly hypnotic. With thanks to Eurocamp for organising our trip to their holiday park at Maisons Laffittes. I love this Sarah and really enjoyed seeing what Ted liked to do – as a teacher of boys I can imagine a similar trip with any one of my classes and the transportation being a highlight! Gorgeous images! !